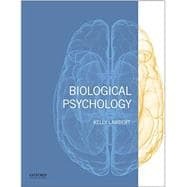 Blending classic scholarship with exciting new developments in the discipline, Biological Psychology offers a fresh perspective on the brain's interaction with its environment. Kelly Lambert is Professor of Behavioral Neuroscience at the University of Richmond. She served as President of the International Behavioral Neuroscience Society from 2009-2011. Dr. Lambert is the author of The Lab Rat Chronicles (2011) and Lifting Depression (2008) and coauthor of Clinical Neuroscience (OUP, 2010). Her popular writing has appeared in various publications including Scientific American and the New York Times, and her research articles have been published in journals such as Nature and Physiology and Behavior.